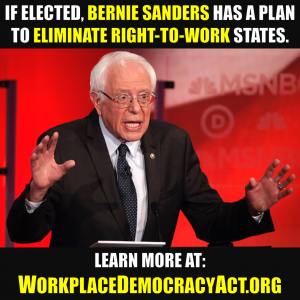 Did Unions Mislead Missourians On The Effects Of Right-To-Work Status? As part of its multi-million dollar campaign to convince Missourians to reject Right-to-Work status, a union-back group used Oklahoma as the ‘bogeyman’ example. 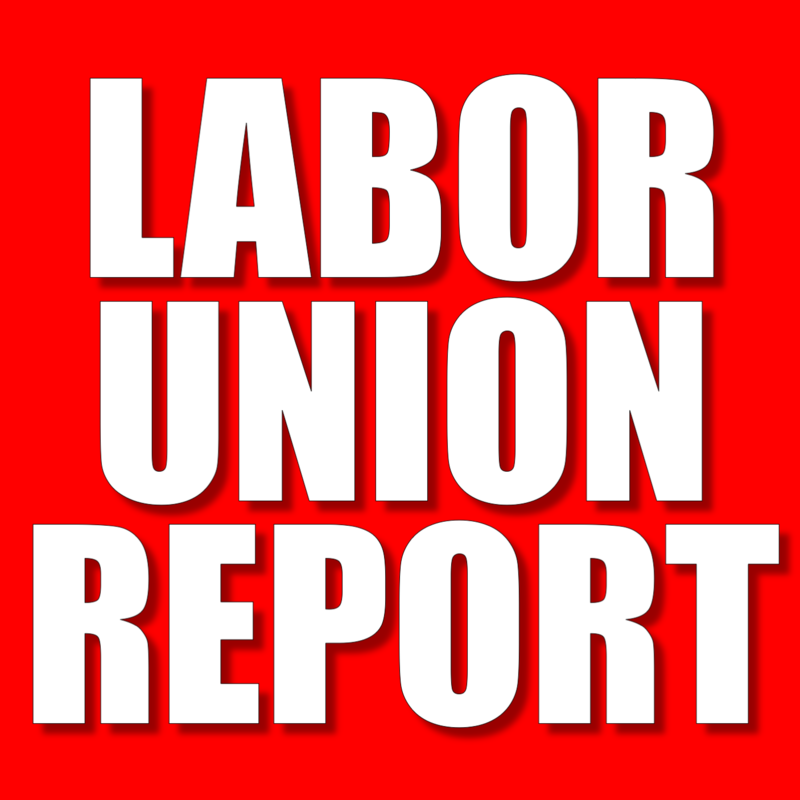 In so doing, though, did the unions mislead Missouri voters? Over the course of the last several months, prior to last week’s vote to reject Right-to-Work status in the state, Missouri voters were bombarded with advertisements and door-to-door canvassers urging them to vote either ‘Yes’ or ‘No’ on Proposition A. In order to preserve their ability to mandate union fees in Missouri, unions throughout the country funneled more than $16 million into the state to run advertisements and their ground game. Ultimately, Missouri voters chose (by a margin of two to one) to keep union fees mandatory in the Show-Me state. In reviewing the unions’ campaign, it appears one of their successful campaign tactics was the use of an ad showing a purported individual from Oklahoma—which became a Right-to-Work state in 2001. Although it is unknown whether the individual in the ad is actually from Oklahoma, or if he is a paid actor using a union script, his testimony does not exactly match Oklahoma’s economic record since becoming a Right-to-Work state. 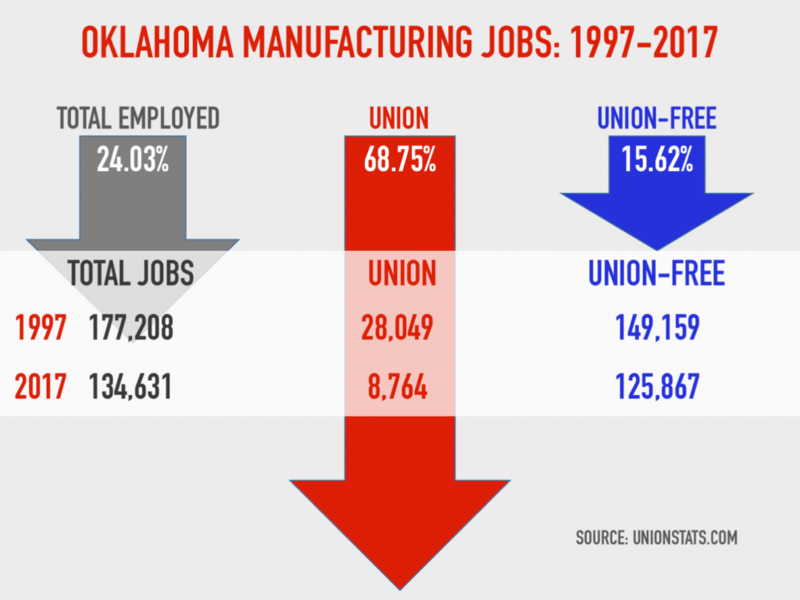 This graph shows that overall—unlike the unions’ video states—Oklahoma has gained jobs since 2001. Additionally, as these two graphs (here and here) illustrate, both household and personal income levels in Oklahoma have generally increased since 2001, when Right-to-Work was passed into law. What has decreased in Oklahoma is the number of manufacturing jobs in the state. However, at the same time Oklahoma’s manufacturing jobs declined, Missouri’s manufacturing jobs were also shrinking—and Missouri did not have a Right-to-Work law to blame the decline on. 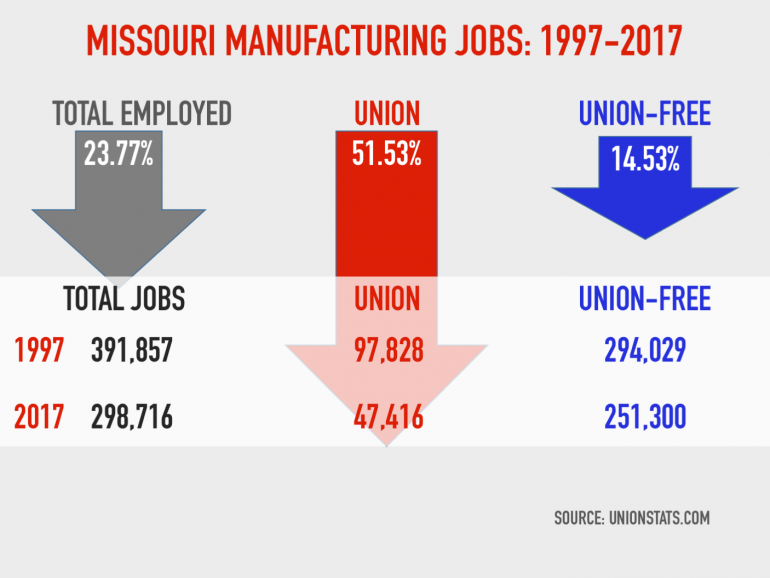 Moreover, both Missouri’s and Oklahoma’s manufacturing job losses occurred at around the same time as all manufacturing jobs in the U.S. declined. 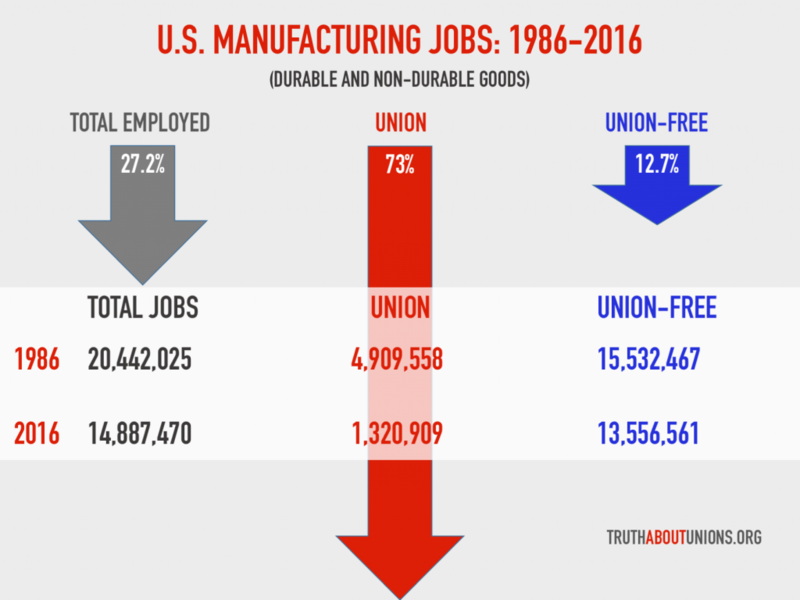 Another item the unions did not mention in their ads is the amount of unionized manufacturing jobs lost overall when compared to union-free manufacturing jobs. Perhaps unions were more concerned with maintaining the ability to mandate union dues than presenting the full story to Missourians.